cardigans and kids: wedding idea and recipe. With wedding season in full swing, my favorite gift idea for the year. 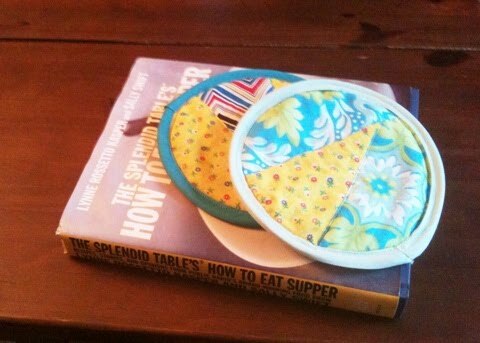 "The Splendid Table's How to Eat Supper" and some cute hot pads using fabrics from my stash (pattern fromHandmade Home). Adapted from "A Homemade Life" by Molly Wizenberg. Preheat oven to 400. Grease muffin tins. In a large bowl, whisk the flour, sugar, baking soda and salt. Add the ginger. In a smaller bowl, lightly beat the eggs. Add the mashed banana, melted butter, vanilla and yogurt and stir well. Stir the ingredients until combined. All flour needs to be mixed in, but do not over stir. Scope into muffin tins. After I have made enough for the kids, I add some chocolate chips for Matheau and I. Crazy that our kids don't like chocolate in their muffins. Can't figure that one out. Bake for 15 minutes. 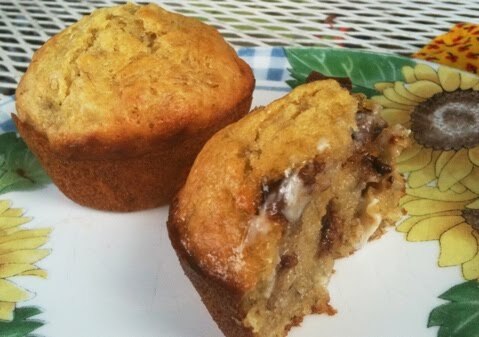 When touch, the muffin should bounce bake (like a cake would).